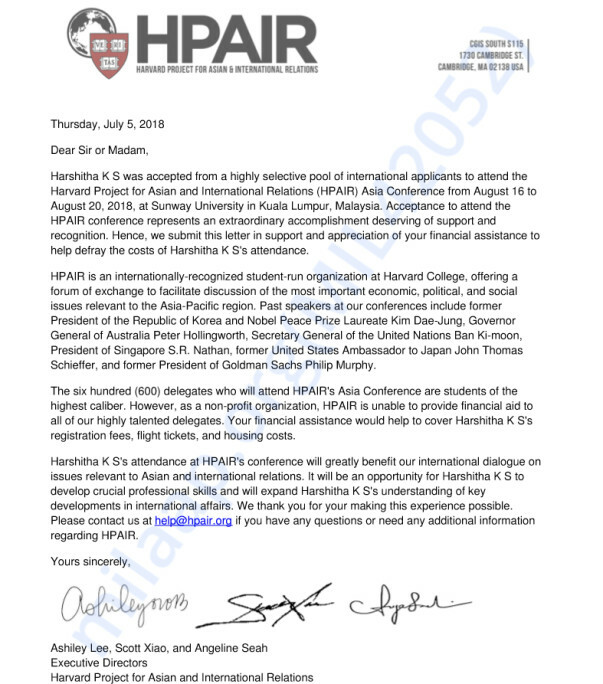 Harshitha K S was accepted from a highly selective pool of international applicants to attend the Harvard Project for Asian and International Relations (HPAIR) Asia Conference from August 16 to August 20, 2018, at Sunway University in Kuala Lumpur, Malaysia. 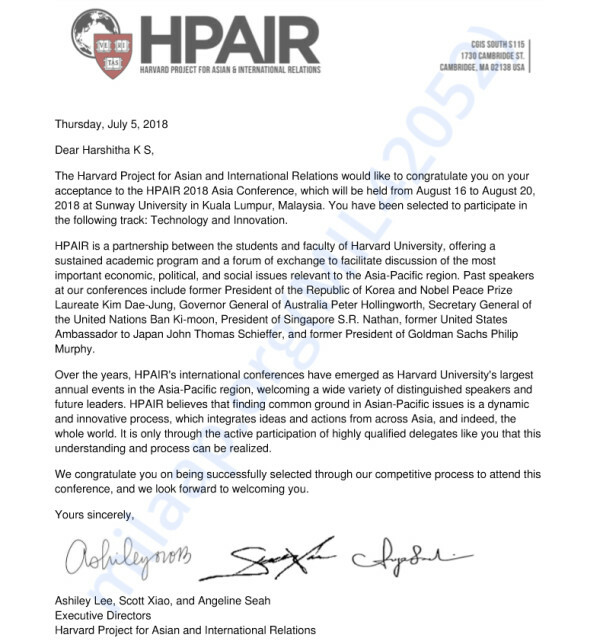 Acceptance to attend the HPAIR conference represents an extraordinary accomplishment deserving of support and recognition. Hence, we submit this letter in support and appreciation of your financial assistance to help defray the costs of Harshitha K S's attendance. HPAIR is an internationally-recognized student-run organization at Harvard College, offering a forum of exchange to facilitate discussion of the most important economic, political, and social issues relevant to the Asia-Pacific region. Past speakers at our conferences include former President of the Republic of Korea and Nobel Peace Prize Laureate Kim Dae-Jung, Governor General of Australia Peter Hollingworth, Secretary General of the United Nations Ban Ki-moon, President of Singapore S.R. Nathan, former United States Ambassador to Japan John Thomas Schieffer, and former President of Goldman Sachs Philip Murphy. The six hundred (600) delegates who will attend HPAIR's Asia Conference are students of the highest caliber. However, as a non-profit organization, HPAIR is unable to provide financial aid to all of our highly talented delegates. Your financial assistance would help to cover Harshitha K S's registration fees, flight tickets, and housing costs. Harshitha K S's attendance at HPAIR's conference will greatly benefit our international dialogue on issues relevant to Asian and international relations. 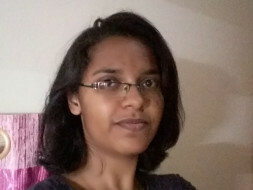 It will be an opportunity for Harshitha K S to develop crucial professional skills and will expand Harshitha K S's understanding of key developments in international affairs. We thank you for your making this experience possible. Please contact us at help@hpair.org if you have any questions or need any additional information regarding HPAIR.